“This annual report showcases our impartiality and evidences the transparency of our mediation process vis-à-vis all complainants”, points out Jean-Pierre Hervé. › Consult annual reports of previous years: 2016 annual report, 2015 annual report, 2014 annual report, 2013 annual report, 2012 annual report, 2011 annual report, 2010 annual report, 2009 annual report. The number of mediation cases handled in the ENGIE Group has once again risen: 17 % more than in 2016, up from 339 to 395, all markets and business units taken together. 93 % of mediation cases concern B2C (individual) customers in the field of energy, making 366 of the 395 applications for mediation received. 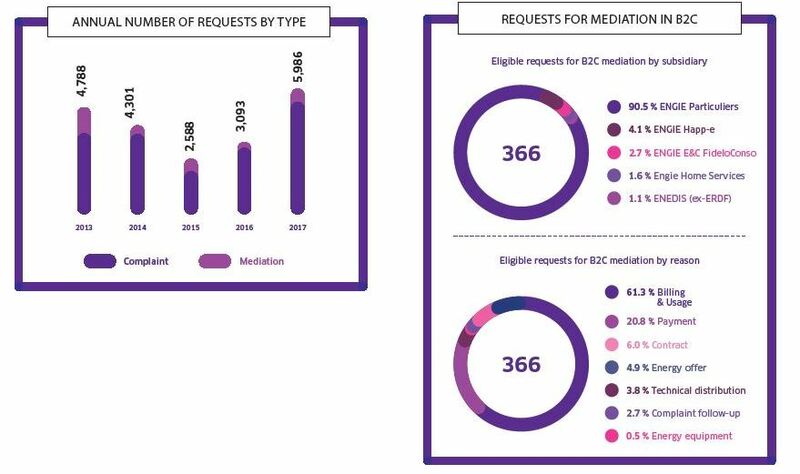 As in 2016, the total number of applications to the Mediator rose in 2017 to 5,986 (+94 % compared with 2016 and +131 % compared with 2015). 89 % of the BtoC solutions proposed during mediation cases were accepted by the parties and implemented. Furthermore, mediation is a swift and effective process: the average settlement time for mediation cases was 59 days (the legal requirement – order of 20 August 2015 in France – is to complete them in under 90 days), compared with much longer legal proceedings. 85 % of complainants are satisfied with the Mediator’s intervention (against 75 % in 2016). This improvement in claimant satisfaction is accounted for by the commitment of the Mediation team to unravelling the cases they handle, while claimants continue to have more exacting demands. Once again this year, most of the applications received concern customers’ comprehension of energy bills, regularization amounts further to incorrect meter readings or adjustments to meter readings further to meter failures. Since 25 February 2016, the independence of the ENGIE Group’s Mediator has been confirmed: he has been approved as “Consumption Mediator” by the Commission d’Evaluation et de Contrôle (CECM) (Mediation Assessment and Regulation Commission) and his report satisfies the criteria stated in the Consumer Code (Order of 20 August 2015). He is on the list of mediators approved by the European Commission. Further to the various disputes he examines, the ENGIE Group’s Mediator makes recommendations to the ENGIE group entities concerned. These recommendations suggest areas for improvement in the handling of customers and their claims, in procedures and in the services offered. These are set out every year in the Mediator’s annual report. The Mediator then works with these entities to ensure his recommendations are followed through. In 2017, on the basis of the special cases he dealt with in the year, the Mediator made 13 recommendations (against 11 in 2016). They were discussed with the ENGIE Group business units concerned to ensure their implementation, as well as with consumer organizations. The details of the recommendations are set out in the annual report on the Mediator’s web site.